They say actions speak louder than words. But since we can’t transport you to one of the weddings we’ve played and let your feet do the talking, for now we’ll just let some of our happy couples be our guarantors. Below is some of the feedback we’ve received in the past few months. You can also check out the amazing reviews over at WedddingsOnline. We hope you had a fantastic new year. Thank you for everything you have done for us. Can you say thank you from us to all of the band. They were fantastic and made our day so wonderful. Everyone has commented on how great the were and they had the dance floor full for the night. Can you say a special thank you to Gavin who was there all day and he was a pleasure to deal with. He made our ceremony so special. The guys were absolutely amazing. The dance floor was heaving to the point it made the room look empty! Even Claire who is still recovering from a broken leg couldn’t be dragged from the dance floor. We missed most of the drinks reception with the photographer but by all guests accounts, they were equally as great! There was even dancing in the drawing rooms. Fair play to the lads for what was a long day of fantastic entertainment! We hope to see the guys again soon and we will be on the lookout for the showcases and recommending them to any one tying the knot in future! Booked Sway for my Wedding and so excited. Very responsive for inquiries! I just wanted to email on behalf of myself and Daniel to say to you all, the band and especially Gavin, thank you so so so much for all you done at our wedding on the 27th September! Literally from the ceremony music (which was beautiful and exactly what we wanted) right through to the band and Gavin DJing at the end we honestly could not of been happier! Everyone was raving about the music, the dance floor didn’t stop all night and the songs played we’re just perfect! I honestly can’t thank you enough, it literally made the day what it was! Really such a fantastic bunch, so talented, professional, no issues at all! We look forward to hopefully seeing them in our local The Old Mill soon! We would like you to pass on our thanks to the lads of Sway Social for the music on the night of our wedding in Waterford Castle on the 24th of August. They were absolutely fantastic and they kept the dance floor full all through their set. They are truly talented musicians and have great stage presence. Once again thank them for helping to make our wedding celebration so special. They are still being talked about by the guests at our wedding which is the strongest praise they can get. Sway Social are booked for our wedding next August. We saw them perform in Clonsilla and they were great, their 80s to 90s covers were impressive and just a lot of fun. In dealing with Joanna to book the guys it has been very easy and straight forward. She replies promptly and is very friendly and great for sharing all the necessary info. Another big reason we liked Sway Social is they play for 3 hours and they are happy for us to choose a handful of songs from their set list that they will definitely play along with learning a first song. Oh and the guys of course sing pretty damn good too!!! Very impressive! Can I just say the band were incredible. They were so professional, so kind and relaxed about the delay in starting. Apart from their kindness and professionalism, their music and entertainment was incredible! Honestly so much fun and such good music, all the oldies were pleased and all the younguns were having a ball! Also Gavin was so amazing as a DJ, one of my friends had requested a song and he told them no as he has a pre-approved list, but then I asked for my friend and he played the song immediately. That is just amazing, so respectful! Thank you! Honestly Joanna we were blown away by every element of the band, DJ and how they handled everything. Please pass this on to them and tell them a big thank you from us. Just want to say a massive thank you to the lads in the band, they were absolutely brilliant and so professional. We didn’t want them to finish! We got so much compliments on how great they were. Thanks again for a great night. We have seen Sway Social a number of times and have become big fans.We were so delighted to have the chance of them playing at our wedding as they always get us up dancing and they put on a great performance song after song, hit after hit! I have been a guest at a wedding sway played at and also seen them playing in other places!! Every time i see them the never fail to please..their variety of songs and interaction with the crowd is very good!! I now have them booked for my own wedding in 2018!! We had Sway Social play at our wedding in May this year. I would like to say a big thank you to Gavin and the guys for doing a fantastic job. All of our guests were raving about them as they got everyone off their seats and got the floor rocking! Also special thank you to Niamh for being so helpful and easy to deal with with the booking. “Thank you to Sway Social for playing at our wedding! They were absolutely incredible, and we loved their version of I’m Gonna be (500 Miles) for our first dance song. They knew how to read the crowd and hype up the energy. A HUGE thanks to Gavin for DJing downstairs. That was exactly what we wanted and we had the best time dancing! Myself and Stephen just wanted to say a huge thank you to the guys in Sway Social for playing at our wedding on the 7th April. They were absolutely amazing and kept the dance floor full all night!! Music was a very important part of our day and we definitely got it right in choosing Sway Social as our wedding band! We had so many comments from our guests on how great the band were! 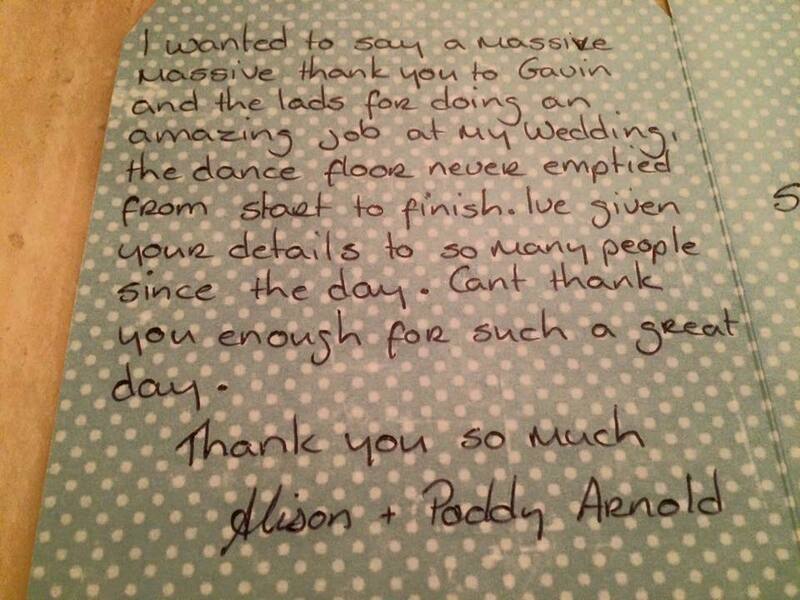 So thanks again to the boys and we would definitely recommend them to anyone looking a band for their wedding. 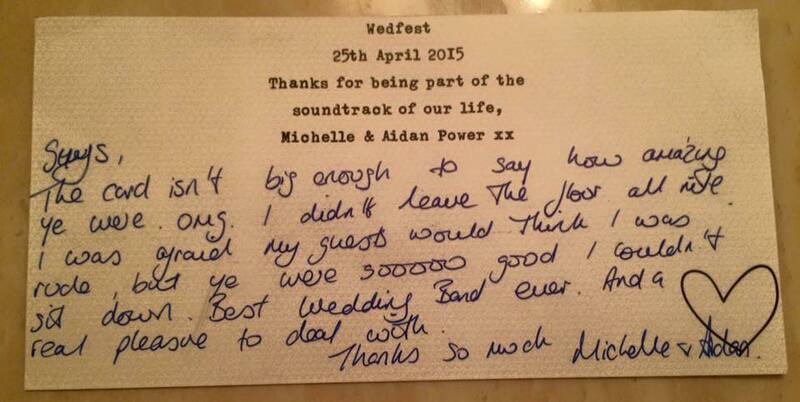 Hi lads, we just wanted to say a massive thank you for playing our wedding in The Millhouse, Slane. You did an amazing job of keeping everyone entertained and the dancefloor full. We had so many guests comment on how good you were and definitely know we made the right choice choosing Sway Social. We would 100% recommend you to all thanks again for being part of our special day. A very big thank you for playing at our wedding. You did an amazing job.We were delighted with the version of Rainy night in Soho, our first dance song, it was a great start to the night. The music was absolutely amazing and ye kept the dance floor rocking all night. All our guests commented on how good the band were. A big thank you to Gavin for being our DJ too! We would definitely recommend you to anyone looking for an excellent wedding band. Just wanted to say that you lads did an amazing job at our wedding last Friday. The dance floor was full the whole night and everybody just loved the music. Music is really important to us and you all did such an amazing job in getting everybody up on the dance floor and creating a brilliant atmosphere. We also couldn’t bear the thoughts of doing a first dance and you helped us in getting around this perfectly! Within seconds the dance floor was full to the sound of The Black Eyed Peas. It was brilliant! Afterwards Gavin did an amazing job as DJ and played all my very many requests. Thank you all so much! I would highly recommend this band/DJ. You all gave us the best party ever and we will have brilliant memories! Fantastic live band, the second we saw them at the showcase we knew they were the band for us. 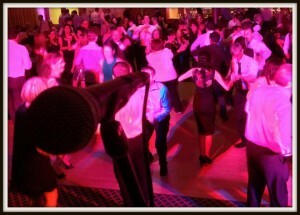 Music to suit everyone at your wedding and a fun, lively, and friendly group. Our wedding was amazing, literally from the first song until the last song of the night the dance floor was full, literally there wasnt a person sitting for the night, both young and old! We are so thankful that we had you as our wedding band. All our guests are still talking about you and asking about you! We really hope you enjoyed our wedding as much as we did and enjoyed your trip to Westport! Heard you at our friend’s wedding and recently in the Clonsilla Inn. Looking forward to having you at our venue! Sway played a complete mixture of songs and all our guests were entertained. More than one occasion I looked at the dance floor and the whole place was rocking. I highly highly recommend Sway Social to anyone who is looking for a wedding band. Choosing a wedding band is important for your wedding. If you want to impress your guests this band will do this. Also behind the scenes working with Niamh & Joanna was extremely smooth, both were so accommodating and very helpful which took a lot of stress away from us. We wish Sway Social every success in the future. So excited to have Sway Social play at our wedding in October! Have seen them live a few times and they are fantastic! Vicky and I would just like to say a massive thank you to you all for making our wedding day so special. The music was absolutely amazing and we have had numerous guests come up to us since the big day and said how good the band were! Thank you so much for accommodating me to play the guitar, and for allowing the best man Tom to play his song later on too. We have such great memories we will look back on in the future. We were so pleased that we got to dance to your live cover for the first dance. It really got the party started and we hope you enjoyed our flash mob!! Many thanks and we hope to see you again in the future. Just to say a sincere Thank You to the lads.They did a bang up job and everyone was delighted with the musicianship,the sound, the pacing and the repertoire.The dance floor never emptied! I can tell you I was very impressed….and much relieved, since it was myself who recommended the band to my son Daragh. I’d have had serious egg on my face if it been a bummer!! Special word of appreciation as well to the whole booking process…painless and efficient. I’ll certainly have no hesitation in recommending the band….not that anybody pays much attention to an old fart like me!! Spotted on Facebook: Sway Social have been a pleasure to work with for our big day. Looking forward to having them make our wedding as special as we hope! Email to the team: MASSIVE thanks to the lads after our wedding. They played a blinder. the dance floor was packed all night and everyone raved about how good the music was! Friends and family kept complimenting how good the guys were. On behalf of my beautiful new bride Sinéad Kelly Ní Bhrádaigh and I, I’d like to say a massive thanks to Gavin, Ed and all the lads in Sway Social! What can I say, you played all the right songs, all night long and had the whole room hopping from start to finish! From the first dance, to the last song it was an absolute joy to the ears and senses! I couldn’t recommend you guys highly enough for any wedding or event that my friends or family might be planning in the future! You really listened to what we wanted and provided a service beyond our expectations! You’s learned and played our first dance song flawlessly! Our guest were singing your praises all night long and were so happy with the entertainment. Thank you so much for making our night such a huge success! A special shout out to Gavin, (lead guitarist and vocals) who when the band finished, broke out the DJ decks and kept the party going into the wee hours of the morning! You took and played all our guests song requests and got everyone fired up! We really appreciate all your hard work and professionalism! Thanks so much! For any newly engaged couples out there…..BOOK SWAY SOCIAL NOW!!!! You won’t be disappointed! Having Sway Social as our band in July 2017 and can’t wait! They have been professional and helpful every step of the way. Hi Guys, we had Sway Social play at our wedding last week and we could not have been happier. The band played such a huge variety of songs and kept the dance floor booming all night. We requested the band sing our first dance which was an Ed Sheeran and we were delighted with their performance, there was not a dry eye in the house. Everyone is still commenting on how good the band was. Thanks you guys so much for the part you played on our special day we were absolutely thrilled and will definitely be recommended you to everyone we know. Dear Sway Social. 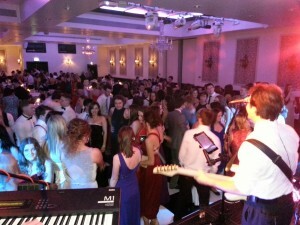 You played at my wedding last Saturday June 24th in the Springfield Hotel in Leixlip. I cannot tell you how much myself and AJ loved the band. You were kind, courteous, extremely professional but above all a brilliant band. As you know I had a surprise guest singing, the brilliant Christy Dignam from Aslan, and while he belted out a few tracks you played for him brilliantly. You made our evening reception a night to be remembered by us and all of our guests. From the bottom of our hearts Sway Social, thank you! Kindest regards Olwyn and AJ. Read more about the wedding crash on Extra.ie right here! We have found the guys to be very friendly and professional! Our wedding is next year but we have seen these guys play live a number of times. They are great craic and have a really good sound to them. They play a wide selection of music and each time we’ve seen them, they’ve really got the crowd going. Looking forward to having them play at our wedding next year. Sorry this has taken so long but we wanted to leave the guys a review for the amazing job they did at our wedding in June. We found out about Sway Social through my dad as he’d seen them play a gig, and from the moment I saw them play in Clonsilla Inn I knew they were the band for us. They didn’t disappoint – they were brilliant from start to finish and made sure the dance floor was packed all night. Loads of people commented on the night about how great the music was and how seamless the tracks all were. A special thanks to Gavin who stayed on to do the DJ’ing – he was absolutely fantastic. We had quite a few people at the wedding from abroad, and they couldn’t believe how the party kept on going! A wedding they won’t forget thanks to the lads! Cheers guys! Just a quick note to say how thankful we are for the performance from Sway Social on our wedding night. The dance floor was full the whole night. They involved the crowd and ourselves and we have heard nothing but compliments since then. Couldn’t recommend you guys more. It was such an important part of the day for us and you nailed it! Apologies for the delay in writing to you , a huge thank you for playing at our wedding at Fernhill Clonakilty, your band was incredible and Aidan and I were over the moon with ye. Our main wish was that everyone got up and danced, and your expertise and professionalism ensured this happened. We had the best day ever and your music added to its specialness. We wish you all the best and thank you once again! I wanted to take a moment to really thank you all for the amazing day that Lauren and Ken had because of all your hard work, patience, kindness, professionalism and “can do” attitude! Really a day like that reminds me not only why I love planning couples wedding but also why I love working with professionals in the industry. There is nothing like the high of seeing the happy couple on the day but also the high of spending a day with others who channel their talents for the same goal. It was really lovely to see so many of you again and meet a few new faces too! I very much look forward to seeing you all again soon. Hey guys we just want to thank you all for making our day even more special with the performance you put on just proves why you all deserve wedding band of the year 2017. You are all gents and everyone of our guests were asking where did we find you’s, even the staff said you were amazing! Thank you all so much for what you did, love your friends – James and Louise. We’ll meet up again to see another great show! Thanks again lads! Just a quick email to say thank you to the lads for Sunday night. First word that comes to mind is ‘wow’. The lads were super and the floor was full all night. When we saw Sway Social at the showcase they were amazing and I only hoped the would be like that at our wedding, but they were even better. From first dance to last they were non stop. Everyone of our guests were raving about them. Also a big thank you for allowing me to share the stage with them for a couple of numbers. They have of course been recommended to all our friends. Thanks again to Sway and yourself and Niamh for all you help during booking and leading up to the wedding. 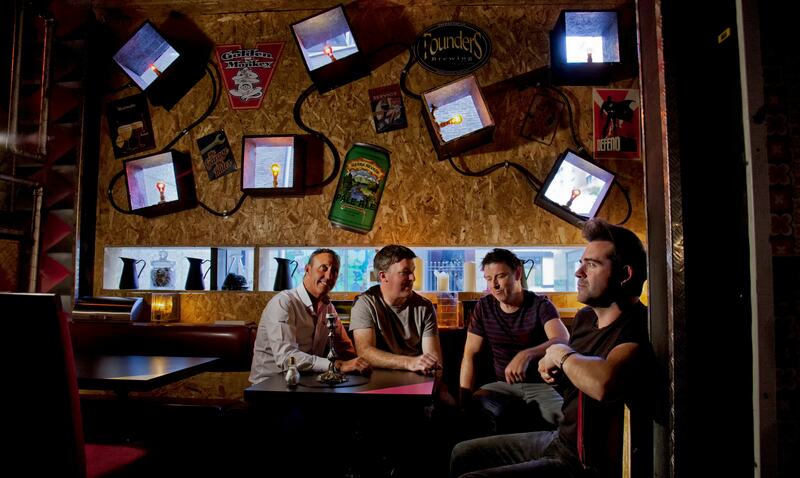 We went to view Sway Social at the Clonsilla Inn show case early in 2016 after seeing their amazing video online. 2 songs in and we were sold. Superb band, great energy coming from the stage and we have no doubt that we will have a great night with Sway. From chatting to the lads after the gig and then through the booking process everything thing was very professional. We would like to thank sway social for such a great night of music at our wedding, everyone danced from start to finish and all our guests loved them. They were just brilliant! Wow what can we say, from start to finish Niamh and Sway Social were fantastic! I am the mother of the bride and the guys covered every part of my daughters wedding with such professionalism. The wedding took place in the stunning Ballymagarvey Village 24/4/17. The Kooky Ukes at the ceremony where fabulous and added something a bit different with a very unique sound!!! The guys covered the drinks reception with guitars which was just lovely, right through to the band and DJ. They were flawless and so well organised. Cannot recommend them enough, everyone at the wedding was asking who they were and saying how they sounded so fantastic!!! So I just wanted to say a big thank you to you all, we will never forget the entertainment that day, you helped to make it a day my family and I will never forget. Thank you again. Looking forward to having Sway Social play for our wedding in April. We have seen them play live and are really happy with them. It is great feeling, so confident about such an important part of your day in the lead up to it. Bring on the 22nd April! Spent a long time looking at bands for our wedding this Easter as music is one of the most important aspects for us. Sway Social have been the best by far we have seen and have happened to have been invited to a lot of weddings in Ireland in recent years. Over the moon to have them booked! Better late than never, but we wanted to say thanks again for performing at our wedding at Kilshane House back in March. Everyone loved the music and it really got the party going. The first song was great too and was very special to both of us! We had Sway Social for our wedding in December 2016. What can I say they are excellent, they had the floor full , great vocalists and I could go on and on. They are great value compared to other bands. I am not easily pleased but they tick all the boxes. Thanks lads for a fantastic night. Carla and John. 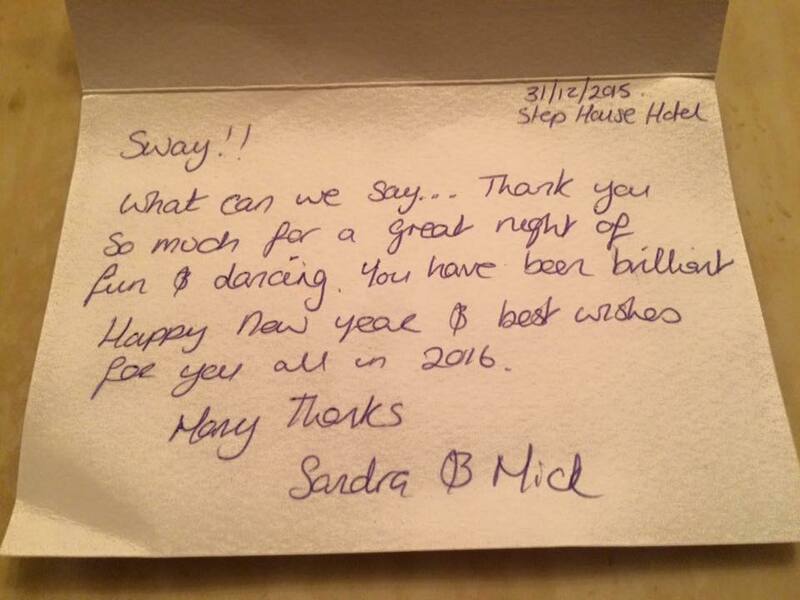 Thank you so much for recommending and booking Sway Social for us. The guys were amazing, so professional and the music was fantastic and catered for all age groups which can be difficult. Feedback on them has been fantastic & I would appreciate if you would pass on my thanks. Thanks again, Michelle. 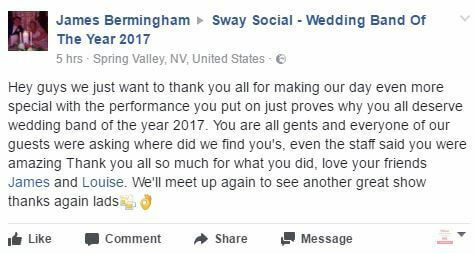 Sway Social played at our wedding a few weeks ago and we are still receiving so many compliments from guests! In fact a few couples have asked us for their details. They are absolutely fantastic and the dance floor was full the whole night. The music catered for the entire crowd plus the sound and professionalism was first class. The band are unique in that all members sing and their voice suits various genres. Any couple will not be disappointed if they book these guys. My husband and I got married on 08/10/2016. When choosing a band for our reception we were nervous as we had never booked a band before, we came across a video of Sway Social online and we were very impressed. We booked them for our wedding, as we had a few requests Joanna was always there on behalf of Sway Social to help and answer our questions. We were absolutely blown away by the band as we saw all our friends and family on the dancefloor at our reception. There was an amazing atmosphere and the choice of songs played by the band as well as a few songs chosen by us made our night so very special. I would highly recommend Sway Social!!! But book them as soon as you can, as they are in popular demand!! We are delighted we chose Sway Social as our wedding band. I can safely say we never got off the dance floor. The guys played a great variety of music and the dance floor was always packed. We would highly recommend them to any couple getting married. A lot of our friends and family are still talking about the fantastic band we had at our wedding. I’m finally getting around to sitting down after the madness of the wedding celebrations and honeymoon. I just want to say a huge thank you to you and Debbie’s from both myself and Ray. I’m sure it’s a worry for all brides and grooms that nobody will be up on dancing but we didn’t need to worry at all. You had the dance floor jammed from the time you started until Gavin finished Dj-ing which we can’t thank you enough for. The singing and playlist was brilliant, worked so well and we have had nothing but compliments from our guests about you. We will be highly recommending you to any friends in the future that are tying the knot. Best of luck with everything lads (and Debbie) Thanks again, Natasha & Ray. Sway social were brilliant at our wedding in September. They had the dance floor full all night. Friends are still talking about how great they were. Thanks a mill for playing our wedding in Carlingford a couple of weeks ago, the floor was hopping, never emptied while yous played, the atmosphere was great. To anyone looking for a great band who can judge the crowd, you will not find better than Sway Social! We didn’t have a chance to see yous before the wedding either but we needn’t have worried, yous were brilliant. From start to finish everything with this band was perfect. From the booking to saying goodbye on the night everything went so smooth. When booking them the responses to my email were prompt and very informative. On the day of our wedding we booked Sway Social to play as the main entertainment and hired the DJ through them also, the music was first class and they even made my best man sound good when got up to sing Bon Jovi with them. There wasn’t any part of the night that there wasn’t people on the dance floor. My wife Danielle Lotty and myself would highly recommend this band to anybody booking a wedding band. Hi Guys, just wanted to say a huge thank you on behalf of Colm and myself to the band. All the guests had an amazing time and were raving about how good the band were. People kept asking where I found you guys, so they were all really impressed. The whole evening was so incredible and the band really made it special. They were amazing. Just wanted to pass on our gratitude. Colm and I had a fabulous time, we especially loved their rendition of ‘Mirrors’ for our first dance. Thank you so much for everything. Warmest regards, Sarah & Colm. I would like to thank Sway Social for playing for our wedding last Saturday in Tralee. Words can’t describe what a wonderful bunch of guys they are. Truly professional in every manner. Guests are still talking about the brilliant music we had. An excellent variety of music to suit everyone made our day very special. I would highly recommend anyone to book Sway Social for any event. I would also like to thank the guys for helping us in a difficult situation in the most professional manner possible. Hope to see you soon at many other weddings 🙂 Thank you. Hi guys, My name is Peter. You performed at my wedding on 5th August at The Ballymac. As we were enjoying ourselves so much I don’t think I got a chance to thank you as you left. So this is just a note to say thank you very much. Your music/singing was brilliant beginning to end and the dance floor was always packed. A lot of the guests also commented on how great you were. So thanks for helping to make the day so special and memorable. We couldn’t have wished for better. Regards, Peter. Oh my god, you guys were absolutely amazing, you had the dancefloor rocking all night! As far as I know, my wife has done up a big review for you guys but I’ll double check and forward it on to you! But all I will say is that you were the best wedding band I have ever heard! I have been to 3 weddings since ours and none of them have even come close to you guys! Absolutely amazing and to this day my guests are still complementing you guys! I have passed on your names to other friends getting married, hopefully our paths will cross again! The band was a big thing for us we spent a lot of time going through lots of options, finally going with Sway Social and we are so happy we did. Can’t recommend these guys enough. My two musician friends who had been to a few weddings this year both commented on how good they are! Very tight musicians. Clean harmonies. Versatile. Most importantly the dance floor was hopping all night! The band Sway Social were fantastic , they had a great sense of humour and the music was brilliant. All our guests danced all night, we had a beautiful wedding and the band were a huge part of that, all our guest are still talking about the group. For any future brides, all I can say is book them and you and your guests will not be disappointed , I know money is tight but this is one area where you need to go that bit further and get a wonderful service and honestly you will not regret it. If we ever had another family celebration I would book Sway Social. A really wonderful band with great personality and more importantly – skill and talent! I would highly recommend them to anyone for any occasion but they are perfect for a wedding. Sway Social had the dancefloor packed all night! Nothing worse than going to a wedding with bored guests and my guests raved about Sway Social, they played songs that suited every guest and the choice of songs were great! 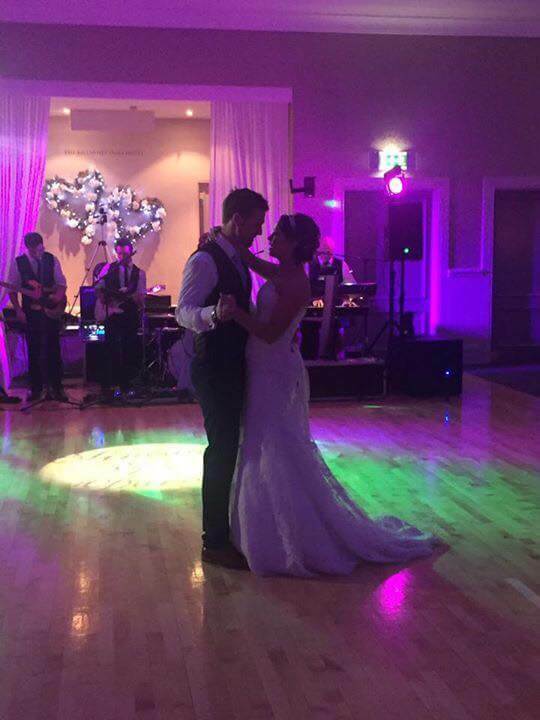 They had the craic with the guests and even let my sister sing while they played background music for our first dance which meant a lot to me! Definitely the band of the year by far! We seen these guys on YouTube and booked them. Because we live abroad we communicated via email and they were always quick to respond. This band was fantastic the night of our wedding, the dance floor never emptied and we had so many people telling us how much they loved them. Since then so many people have contacted us asking for their details and we have happily recommended them. The band were fantastic from the minute we booked them. Their communication with us was brilliant in terms of getting a feel for the songs we would like and the age group of those attending a wedding. On the night they played for 3 hours despite a late start as the meal ran over. Their energy was amazing and the range of songs had everyone dancing. Our guests are still asking who our band was. 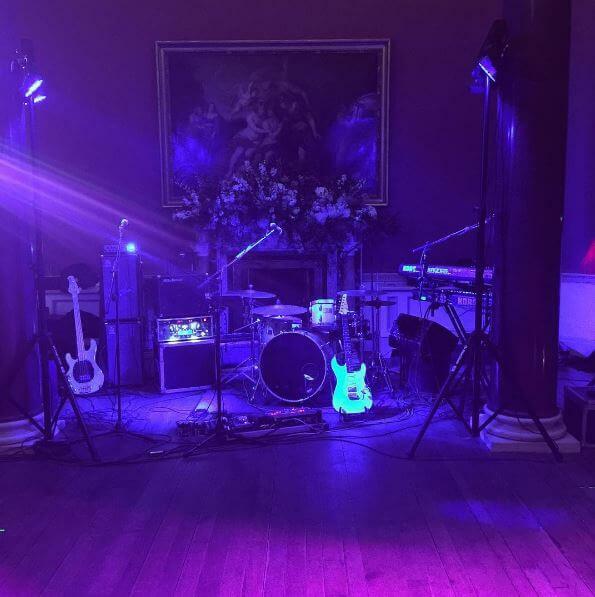 We were lucky enough to have Sway Social play at our wedding , they were a dream to work with from start to finish from booking them with Niamh from MusicAngel to dealing with the guys on the night . I really love my bands and felt it was one of important decisions when planning your day and Sway Social didn’t disappoint , 10/10 , the dance floor was full from the first tune straight through the night playing something for everyone. We had to ask the lads to start later on the night than was originally planned, this wasn’t an issue at all and the lads were more than accommodating to us .Sway Social really topped off a fantastic day and we would highly recommend them . Thanks to Niamh and all the guys from Sway Social. From originally enquiring about the band to the actual wedding, it was one of the easiest items on my to do list. The guys themselves were very attentive to both our venue and the fact that we only had a small wedding party. All of our guests complimented their talent and quirky sense of humour (they were so good, they managed to get my 95 year old granny on the dancefloor). 5 stars for the whole team. Hello Sway Social! You guys played at our wedding on the 21st of May in FOTA Island and we just want to say a massive thank you for making it a night to remember. To say you rocked the night away would be an understatement. We just had an absolute ball and ‘Sway Social’ played a huge part in that.. From the ‘guitar duo’ at the drinks reception to everyone dancing the night away with ‘Sway Social’, we really couldn’t have asked for more. All our guests said you were amazing and loved every minute of it! The dance floor was on fire all night long!! It took people’s feet a few weeks to recover 🙂 We have recommended you to everyone we know planning on getting married. Hope to hear you play again soon! Thanks again, Elaine & Dennis. Ah stop! Not only did our venue win, our band did too! We picked good!! Celebrate good times,come on!! Amazing band! We would like to thank Sway Social for performing at our wedding. From the time we booked them to the day of our wedding, they were very helpful. They had our guests up and dancing all night till the end and thank you for the excellent DJ service. We would highly recommend this band for a wedding or any other occasion. With thanks, Damien and Paula. Sway were the easiest suppliers to deal with which was so refreshing. Completely professional. 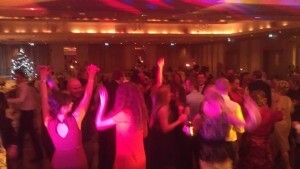 All our guests loved them, the dance floor was always full!!! 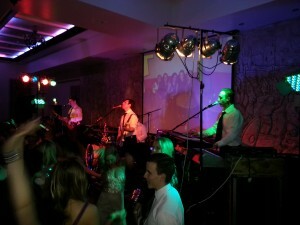 I hired the band Sway Social for my 50th Birthday Party in The Portmarnock Hotel. I cannot recommend this band highly enough, they are amazing and such a lovely bunch of lads. They read the crowd perfectly and I can honestly say the dance floor was full all night long, they were professional at all times and even looked like they were enjoying themselves even though they must have been tired, as they played non stop for 3 hours. I wish I had another party to organise and I would have them booked straight away. Amazing…. Every time I read a review for a band I took it with a pinch of salt. Everyone has their own taste after all. I booked the lads based on the reviews I read here and thought why not. Without question it was the best decision in relation to the wedding that we made. They were magnificent. They were easy to deal with from day one and were always contactable through the super Niamh and her team. They sang the song for our first dance which wasn’t exactly mainstream and did a wonderful rendition. From that moment the dance floor was rockin’. I can honestly say it didn’t let up for the entire set. I wholeheartedly recommend Sway Social and cannot be more effusive in my praise. 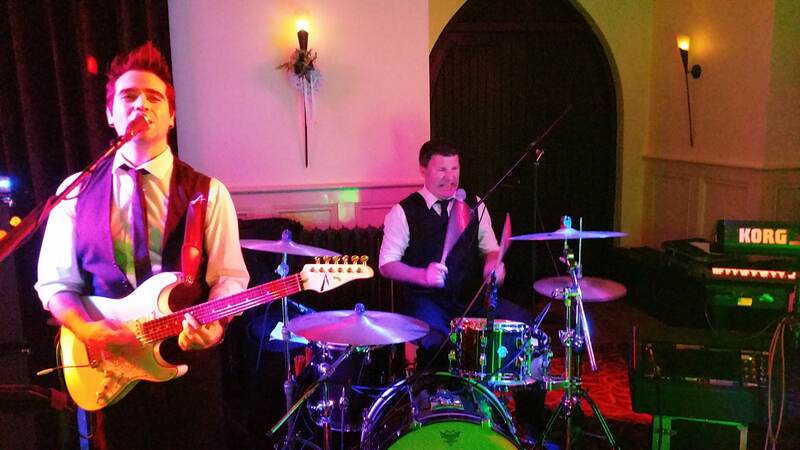 Thanks lads, simply awesome……..
.The Sway Social guys were phenomenal at our wedding!! I’m still amazed at how well they read the crowd and played songs that suited both the young and older guests to perfection. The singing was fantastic, the volume level was just right(!) and the dancefloor was never empty. Loads of people, young and old, have since complimented us on our choice of band and asked who they were. I think the biggest compliment was when my older relatives told me how much they enjoyed them – they’re sometimes the hardest to please! 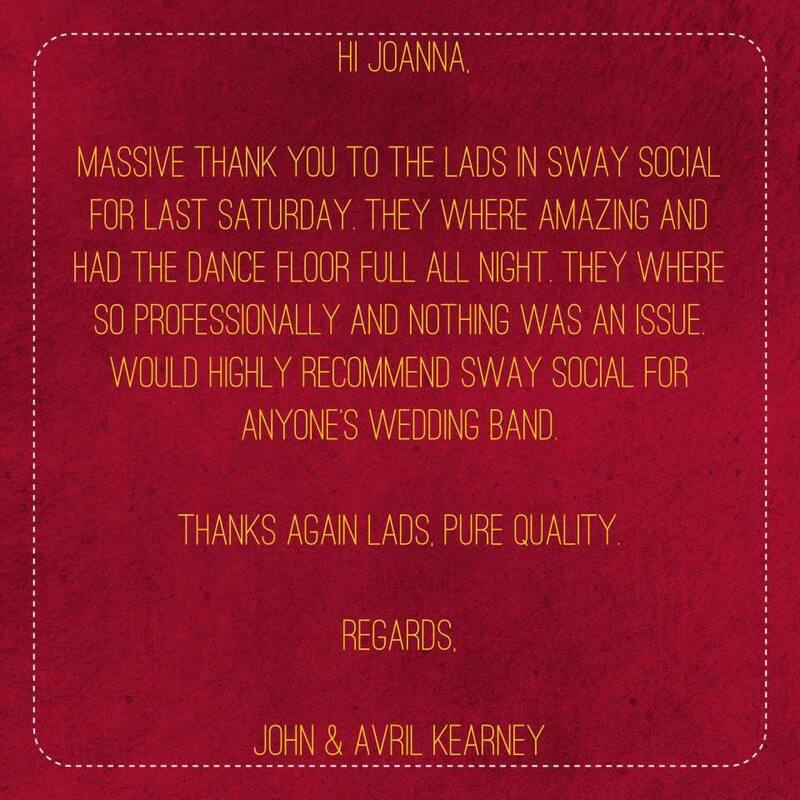 We couldn’t be happier that we booked Sway Social and can’t recommend them highly enough to all future brides and grooms 🙂 Thank you so much! .Sway! What can I say, thank you so much for the great night of fun & dancing! You have been brilliant. Happy New Year & best wishes for you all in 2016, many thanks! Look nowhere else guys. Sway Social will not disappoint. From booking them to seeing them leave on our wedding day, they were a pleasure to deal with. The dance floor was full from start to finish with lead singer Gavin playing a blinder. All the lads can sing too which is great. Not much more to say really but I’d highly recommend this band to anyone. From start to finish, you were a pleasure to deal with! Sway Social work with a minimum amount of fuss which was brilliant as planning a wedding is stressful enough as it is! During the whole event, everyone commented on how great they were, they didn’t have a rigid setlist and were great at working out the mood of the room and playing music that could be enjoyed by all! The dancefloor was jam-packed throughout the whole night and we’ve never seen people dance as much at a wedding! There is a great mix of contemporary and classic music which was again received by all. We did have concerns beforehand never having heard the band live(based in London), but we had nothing to fear! They were awesome! 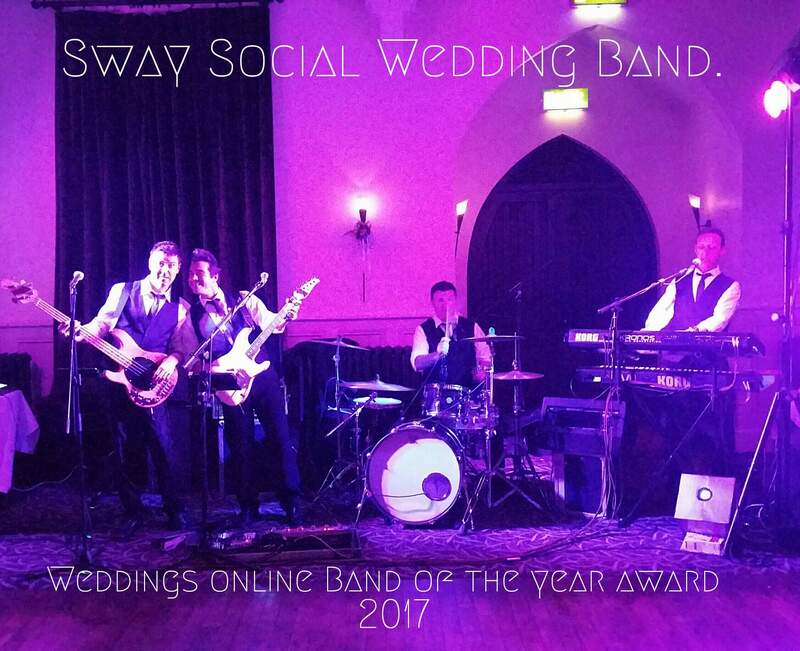 After the wedding, a couple of our guests who are also involved in a wedding band told us that Sway Social were the best wedding band they had heard. Couldn’t recommend the band more, they helped make our day amazing! Thanks a mil, Paddy & Grace. Very happy memories from Halloween 2015 in Westport Woods hotel for our wedding! I couldn’t recommend these guys any more…they played at my wedding last Friday and the dancefloor never emptied for the entire night, their mix of music was fantastic! All ages entertained!! Thanks so much guys! More than happy to cast my vote. I recently had Sway Social play at my wedding and they were amazing. Everyone at my wedding thought so too. At no time was the dance floor empty. They catered for everyone and are four lovely guys. Highly recommend If anyone looking for a band. Thanks guys for a great night and for helping making our day so special! Sway went above and beyond expectations. They were absolutely fabulous and so much fun. Even a year later our friends and family are still talking about how fantastic the band was. We wouldn’t change a thing! 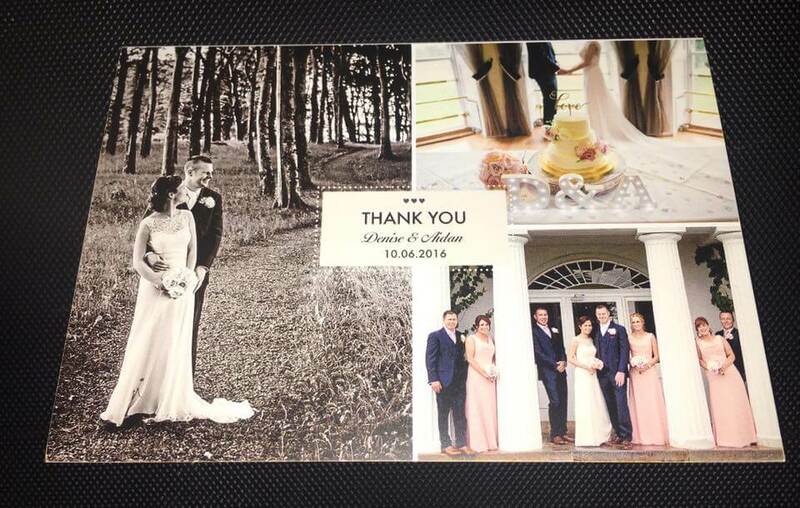 I want to say an overdue THANK YOU for everything on Casey and TJ’s wedding day on the 26th Sept 2015. It was such a beautiful day and they truly had the perfect day that wanted!! Thank you for your professionalism, enthusiasm and hard work on the day! I look forward to working with you all again in the near future! I’m finally getting around to sitting down after the madness of the wedding celebrations and honeymoon. I just want to say a huge thank you to you from both myself and ray. Im sure its a worry for all brides and grooms that nobody will be up on dancing but we didn’t need to worry at all, you’s had the dance floor jammed from the time you’s started until the Gavin finished dj’ing which we can’t thank you enough for. 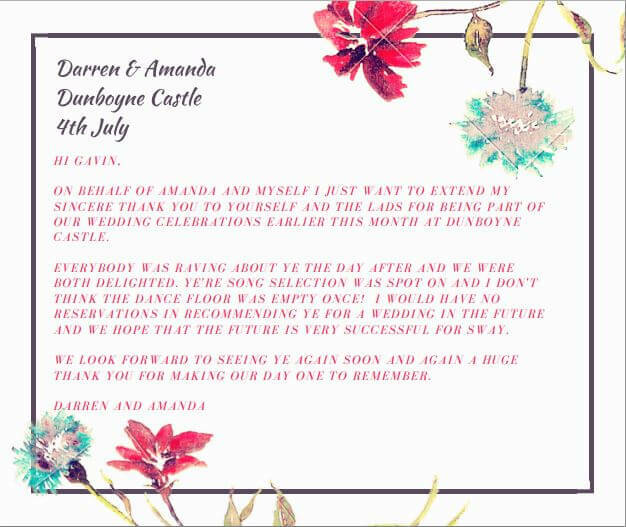 The singing and playlist was brilliant, worked so well and we have had nothing but compliments from our guests about you..
We will be highly recommending you to any friends in the future that are tying the knot. Sway Social rocked my wedding. I have to say the best band I’ve heard in a long time for weddings. They were awesome. My guests are still talking about how great the band were. I would highly recommend them and all a great bunch of lads too. Thanks a million for a great evening. Absolutely fantastic band who had the dance floor hopping all night! Great mixture of new and old music and they are happy to learn your first dance song if they don’t already know it. I would highly recommend this band for any couple planning their wedding. Very happy with our choice of band and DJ for our wedding reception entertainment. Sway Social set up on time and were fantastic as a live band. All of our guests were complimenting us on how good they were. They even played our choice of first dance which wasn’t on their advertised playlist. As a party DJ, the lead singer was very good. Playing as many requests as he could as well as reading the audiences mood/taste for 90’s dance tracks late on. Sway Social provided our Band & DJ. From the moment they commenced the dance floor was never empty. Our wedding guests were of a wide age range so it is an absolute credit to the band that they catered for all ages. Their terms are that they select the music based on the atmosphere of the room which we agree with however we as the bridal couple would have liked to have some more influence of our taste of music. We did specify our first dance song which was played perfectly. We also asked for the groom (who was a professional signer) to sing a specific song to a certain tempo. We were disappointed with the responsiveness to this request that was made a number of weeks before the wedding date & also on the night the band did not engage with the groom before they commenced playing the music. This was a very special moment for us as the bride & groom surrounded by our guests, however the vast majority of the guests were not even aware that it was the groom singing. these are the lads who done my wedding ….quality! Guys, I didn’t leave the floor all night! I couldn’t sit down. Best wedding band ever. And a real pleasure to deal with! Just a quick note to say a horribly late thank you for the 14th February in Ballinacurra! You guys were an absolute dream to work with from start to finish!!!!!! It only really dawned on me in the week coming up to the wedding that I had only booked you based on the demo video I saw on YouTube – I had read a few reviews, but not really done my homework, and I did start to get a bit panicked, but there was no need whatsoever for it. Vincent and I thoroughly enjoyed all the music and everyone we’ve been speaking to since has been raving about ye, so thank you so much. You’re a very very talented bunch of guys and very professional to work with and everything went so smoothly on the night it was amazing. So, if you are affiliated to any sites, or if there is anywhere that you would like me to leave any reviews, just say the word as to where and I’ll be more than happy to oblige! Hope wedding season is in full flight for ye and best of luck in the future! This was an exciting weekend for Sway Social. 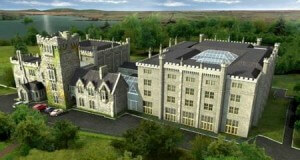 We were required to step in at the last minute to play an event at Celbridge manor. Short notice? No problem! We were only delighted to help Deirdre out of a jam. Here’s what she had to say about the night. We’re glad she had as much craic as we did! Just wanted to thank you once again for coming to the rescue – for organising a band so quickly for the retirement party. We had a fantastic night! Sway Social Music were brilliant! They were so easy to deal with. They tailored the music to our crowd – which had a big mix of ages, moved with ease between different genres and played requests! Shona & myself would like to say thank you so much for Saturday night, you guys were fantastic and everyone commented on how good you were. You made our night very special and for that we thank you so much. We will certainly recommend ‘SWAY’ for anybody looking for a band. Please pass on our thanks to the rest of the band and we are sure you will be very successful in the future. from dancing at the end of the night, which is exactly what we wanted haha! We had the fortune to play at the annual UCD Ball and received a personal note from the UCD committee the following day. I think it’s safe to say that we have the UCD Seal of approval down. “I think it’s safe to say that Sway were the reason that our dancefloor hit capacity early on in the night! day. First of all, thank you all for learning our first dance wedding song it was superb. From the word go we could see that our guests were having a truly brilliant time, the floor was constantly full of people dancing and the vibe in the room was something we were delighted with. I know it’s a bit of a cliché, but it really was a fantastic day and a fantastic night to remember thanks to you guys. The music you played was excellent and you even assisted us in requests that were asked for. Both Matt and I took great pride in talking to our guests the next day at the BBQ and some guests even asked if we had you again for tonight. I wish we did. But I just wanted to write this quick note to show you our appreciation. I wish you all the best in future and you have to let us know the next time you are playing in Cork. Social’s praises to all of our friends! guests were full of nothing but compliments about them! We can’t thank you enough for recommending them to us!! Myself & Andrew just wanted to say thank you for all your help with our booking. You made us feel very special & delt superbly with all our inquiries. We had Sway Social performing at our wedding , and we are delighted with the choice we made. The band’s performance was fantastic and the guys were so professional from the moment they started setting up to the end of the night! Defiantly would highly recommend you & the guys! And wish all the best! Just a quick email to say how thank you so much for performing at our ceremony last week! We couldn’t thank you enough for all the help choosing the setlist & you were so professional & understanding and alongside the Kooky Ukes for our reception , we could not have picked better bands for our special day. Thank you so much for playing a fantastic set at our wedding ! You were so lively & the dance floor was filled with great energy. Everybody danced their socks off & we got lots of compliments about our entertainment choice! I couldn’t recommend you guys enough!